You do the same thing for years. And then one day you decide to do it differently. And it’s like a door opening to a whole new world. A world on your doorstep that’s been there all along, only you just didn’t know about it. Take this summer, when, after many years of flying to our house in Majorca, we decided to take the car and drive instead. There were practical reasons – we had stuff we wanted to take with us that we couldn’t fit into a suitcase, we were going to be out there for a while so it made sense to have our own car. And we had had enough of airports; we felt like a change. But it wasn’t just about practicality. We were looking to combine function with some fun. What we didn’t realise was quite how much fun was in store for us. 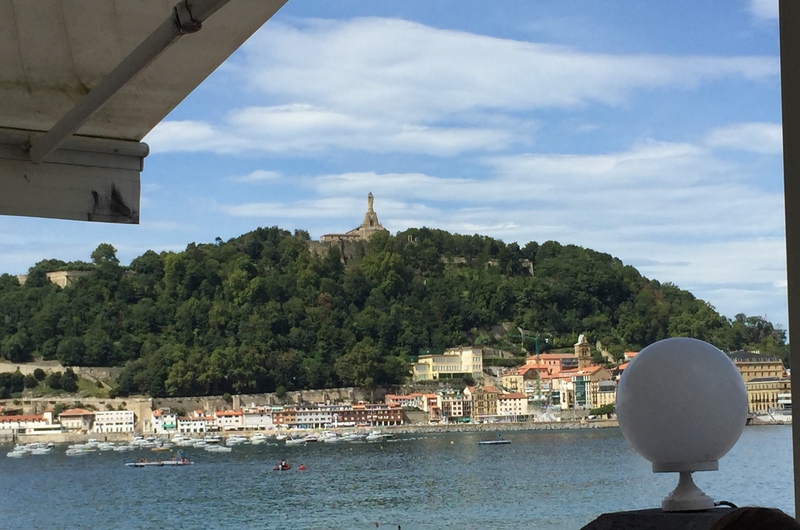 I’ve written about our boat trip to Bilbao with Brittany Ferries, and our first night in San Sebastian in my post The San Sebastian Crawl, so I won’t go over it again. Suffice to say we had a ball! But the Pintxos bar tour we enjoyed, in the company of the lovely Esther from San Sebastian Pintxos Tours, turned out to be a good metaphor for the journey. Bite sized portions of experience; little tasters of amazing places. There and back we didn’t stay more than a night anywhere. 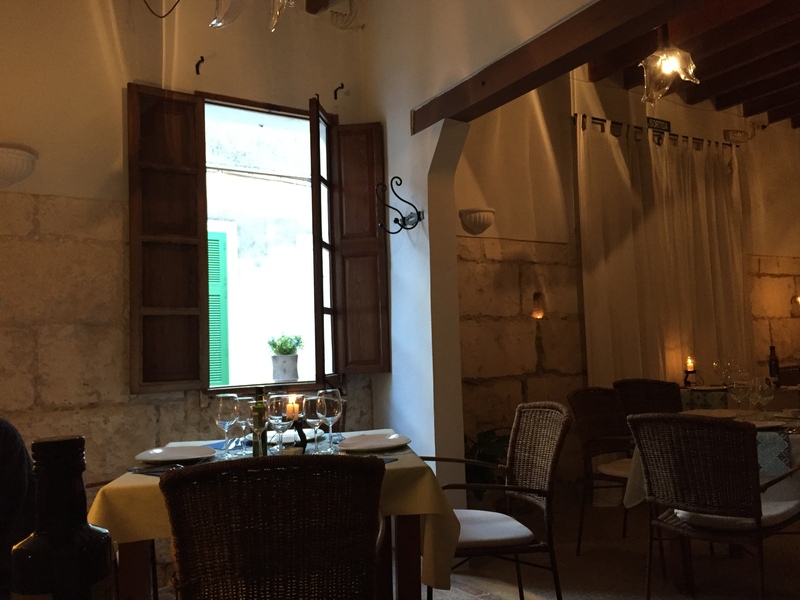 But thanks to the meticulous research and careful planning of my top-notch concierge (aka my husband), our experience of each place we visited was memorable, enough to give us a real flavour without overfacing us. 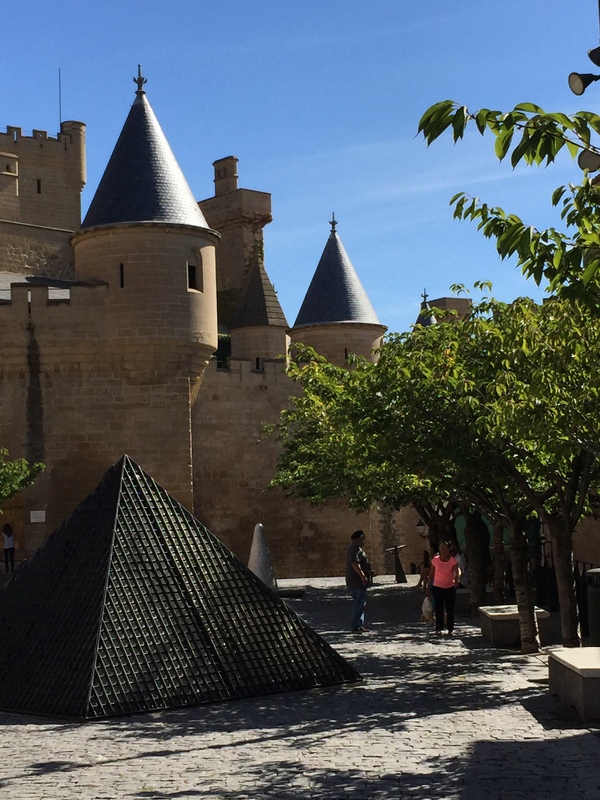 After our unforgettable night in San Sebastian we headed south, stopping for coffee on our way in the mediaeval town of Olite with its fairytale castle. And then on to a blow out lunch at Restaurante 33 in Tudela (described in my post A Serious Case of PTS). The drive to Barcelona took us about five hours in total, taking us away from the wooded mountains of the north into the flat, dry expanse of central Spain. Not always the most exciting of scenery, but great roads. And we kept ourselves amused listening to podcasts of Cabin Pressure with Benedict Cumberbatch playing a useless pilot and Roger Allam as his cynical, world weary co-pilot. Greatly to be recommended; the time flew by. We came into Barcelona in the late afternoon, negotiating our way through this busy, beautiful city with the help of the satnav (absolutely essential bit of kit without which we would probably be filing for divorce by now. How did people manage without them?) A few hours to fill before heading for the port to catch our ferry to Majorca, a bit of anxiety about where to leave the luggage filled car in notoriously thief friendly Barcelona, a complete lack of hunger due to massive eight course lunch eaten in Tudela; we were a little uncertain of what to do with ourselves. So we headed for the Olympic Park area which is near the port, found a secure car park to leave the car, and went for a stroll. This part of Barcelona is part beach holiday, part super modern, stylish city. Look to your left as you wander along the esplanade and there are people playing volleyball on the beach, couples strolling barefoot along the water’s edge hand in hand. Look to your right and there are skyscrapers and fountains and wide boulevards streaming with Friday afternoon traffic. We went in to the achingly stylish Arts Hotel for a drink, feeling a little out of place in its hushed corridors and elegant reception. We were carworn, battered and dusty, and ready to sit in a heap and rest up a bit. 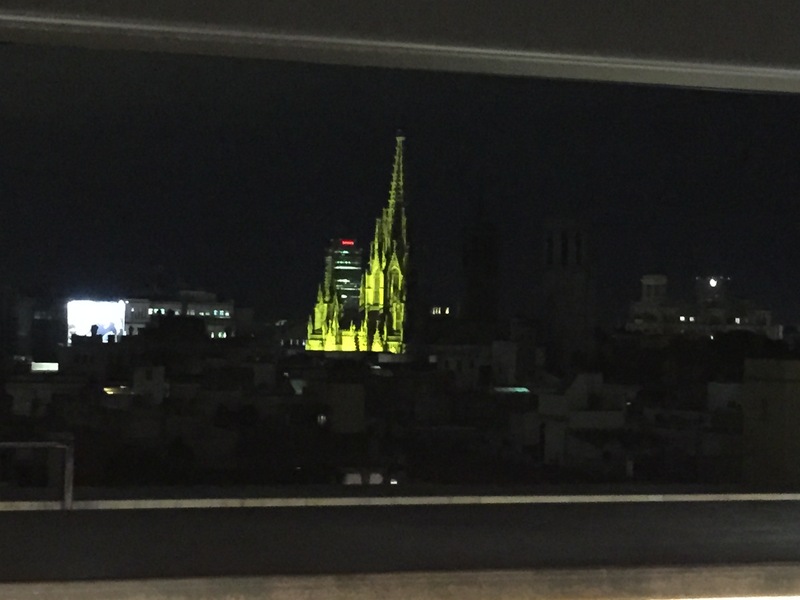 This hotel was crawling with the beautiful and the best of Barcelona, and we couldn’t help feeling we were not quite fitting in. Still it was an experience, and a beautiful place, and worth a visit if for nothing else than the stunning flower arrangements in the lobby. After a drink in the bar, and a promise to ourselves to come back when we were a little less scruffy, we went back to the car and headed for the ferry port. This was the trickiest moment of our journey. Roads are mega busy, night has fallen, and the satnav takes us to a road closed by a barrier, and a mean looking policeman is waving us away from where we want to go. Luckily we’ve left lots of time, and the satnav rethinks and leads us through tunnels and around roundabouts, so we get to the port with time to spare. Which is a very good thing. Because there seem to be no signs and no way of knowing where we are meant to go and what we are meant to do. We just follow the herd, hoping that the herd is going where we are going. Graham stops and winds down the window to ask directions from a guy in a reflective jacket, who could be anyone but fortunately turns out to be someone who knows what’s going on. He tells us that we have to swap our printout ticket for a proper ticket or we won’t get onto the boat. We park and Graham goes off to do the necessary, comes back and informs me that I’ve got to go on board by foot. This is going to sound daft, but it was a weird and rather unsettling experience, leaving him in the car on the dockside and heading off in the dark to a building in the distance, to stand in a long and extremely chaotic queue, which snaked in and out of the building and seemed uncertain whether it was a queue for Alcudia or Cuitedella. Turned out it was the queue for both; the ferry was dropping off in Alcudia and then going on to Menorca. Phew!! I stood at the back of it, played Tetris on my phone and tried to look unconcerned, while the people in front of me argued in angry Spanish, and children screamed around me. Graham and I found each other on the boat and fell on each other with relief. We had to queue to hand in our ticket in exchange for the key to our basic but perfectly acceptable cabin. This ferry was not in the same league as the Brittany Ferries boat from Portsmouth but we were only on it for six hours. 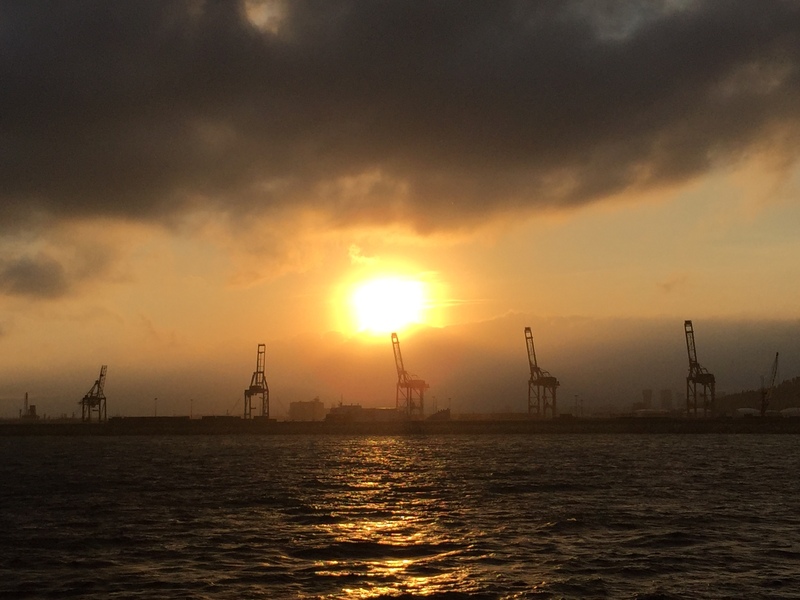 As we pulled away from the dock and slowly made our way towards open sea, we slid past a long, lean, multi-decked boat that was crying out to be stared at. It was moored alone against the quay, well away from any other boat. It’s five decks were lit up, and we could see spacious seating areas with fabulous furniture, a beautiful dining table with inlaid wood, a super cool bar. There seemed to be nobody on board until we caught sight of a couple of figures leaning on the rails, watching as our ferry went slowly past. It was too dark to take a decent picture. But I found this photo online so you can see for yourselves. Because of course we googled the name! One of these isn’t enough! It’s called Eclipse. 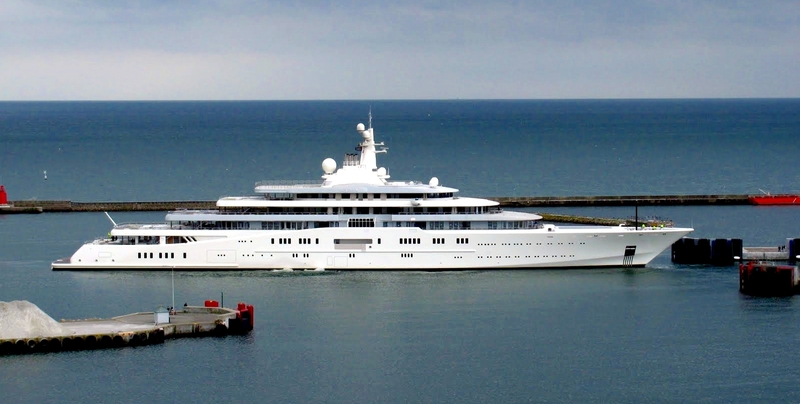 And it turns out it’s one of Roman Abramovitch’s fleet of five. Five!!! This boat has two helicopter pads, two swimming pools, 24 guest cabins, 70 crew, several hot tubs, a disco hall and a mini submarine. How have we managed all these years without a mini submarine??? Once we were under way we found our cabin and slept. Up at 4.30am (!) in time to peer out of the porthole as Pollenca Bay loomed up and past us in the darkness, lights twinkling in the distance to tell us we’re nearly there. Back down to the car, dock in Alcudia, drive off ferry straight into dark streets, twenty minutes to our house; only sign of life in Puerto Pollenca at this hour is staggering teenagers weaving their way home after a long night at Chivas. And we’re there. Three days journeying as opposed to six hours. A fair bit of time in the car. But what a great way to travel. We’re in Majorca for just over three weeks. Weather unsettled for some of the time, but not so it’s a problem. We do what we usually do, which is enjoy ourselves. 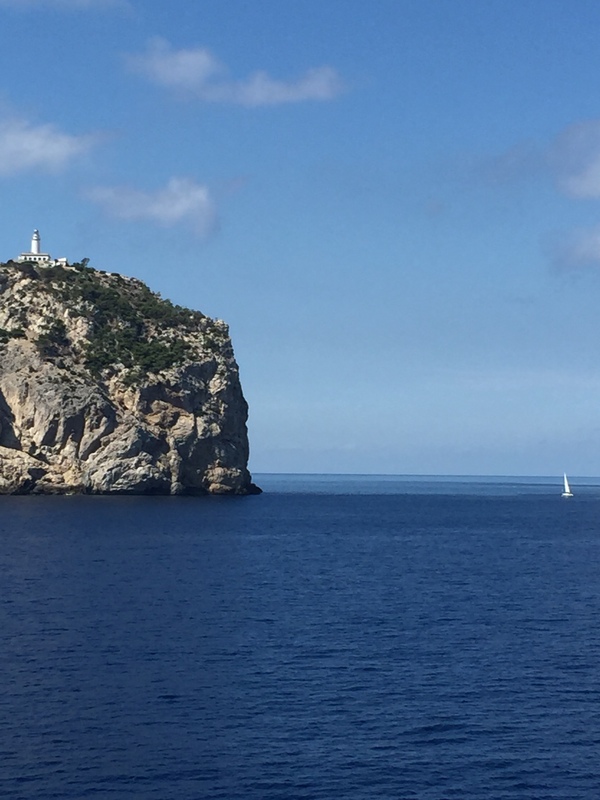 Make a few new discoveries: walking over to Cala San Vicenz before breakfast, eating tapas by the side of the lovely bay of Puerto de Soller, enjoying a spectacular dinner at the fantastic Marie Nostrum restaurant in Sa Pobla. 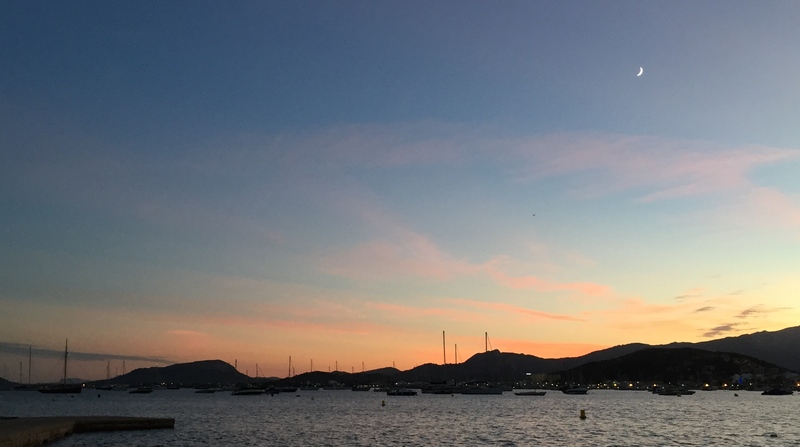 We spend a lot of time sitting by the water’s edge in our own lovely bay of Puerto de Pollenca, enjoying some truly spectacular sunsets, and telling ourselves for the umpteenth time that there really is nowhere else we’d rather be. And all too soon it is time to think about packing up and going home. But the great thing is that this year the holiday doesn’t end when we leave our house to head for the airport. This year it started when we walked out of our front door in England, and will end when we walk back in again. The getting there and the going home are as much part of the holiday as the being there. Which means that, as the day approaches when it’s time to leave, we don’t feel blue at the thought of it all coming to an end. Instead we feel excited at the thought of our journey home. We leave on one of those perfect days you get in Majorca at the tail end of the summer, when the sun is just beginning to lose its intensity, the air is soft and clear, the wind has melted away so that the sea in the bay is as still and reflective as a mirror, the temperature in the shade is spot on body temperature, you feel completely at one with your surroundings, and very very happy. It’s hard to say goodbye on such a day. But rather than feeling sad to be going, we feel blessed to have such great conditions for travelling by boat, because we will get to see the island at its best. Fifteen minutes drive to the ferry port. The same weird procedure where passengers have to go on board separately from the car. But this time when Graham and I say a temporary goodbye to each other it’s in bright sunshine and we’re prepared for it, so it’s not quite so traumatic! I find a spot in the bar on the top deck, and gaze out at people on sun loungers, sunbathing in their bikinis and swimming trunks (this is a ferry with a swimming pool!). Do I miss Palma airport? NO I DO NOT. When Graham joins me we go and find a place to say a proper goodbye to the island. The boat slips gently out on a turquoise blue sea. We lean on the rail and drink in the view with our eyes. 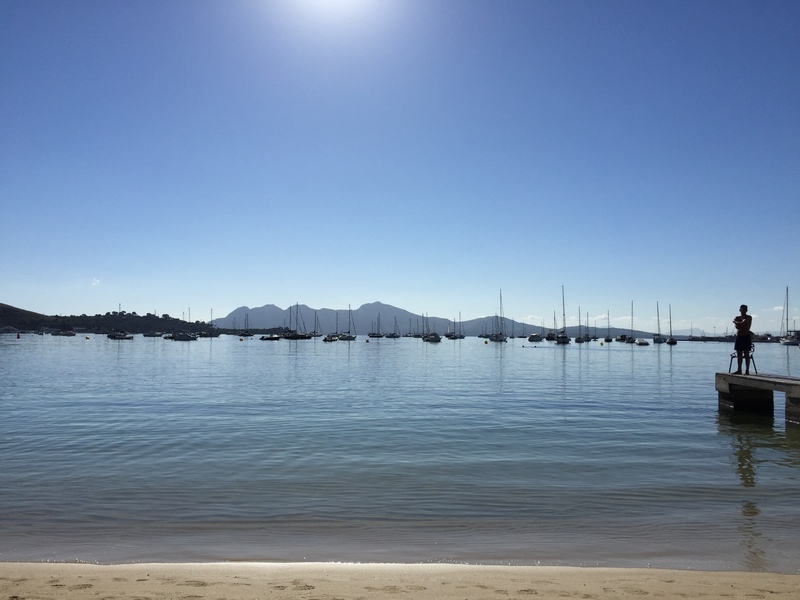 On a day like this one there simply cannot be anywhere in the world more beautiful than this glorious island of Majorca. And we feel incredibly lucky to be seeing it this way. We watch for as long as we can, while the island softens and dissolves into the distance, until there’s no trace of it on the horizon. Then we find a spot to settle down and talk and eat and read for the six hours it takes us to reach Barcelona. Barcelona. It’s a wonderful town. The skies as we approach give a hint of what is in store for us. They’re eye catching, dramatic, beautiful. We drive off the ferry and check in to the supremely comfortable, very friendly and welcoming, couldn’t be in a better position, H1898 hotel; located a matter of metres off La Rambla, the street that is the soul of Barcelona. This is the old town, very different to the super modern and stylish Olympic area that we had visited on our way out. But equally as stunning. We have dinner on the roof terrace of the hotel: really good tapas (and we’ve eaten a fair bit on this trip so we know what we’re talking about!) and great views across the city. The tower of the cathedral is close by, piercing the roofline, changing colour before our eyes, one moment pink, one moment purple, one moment green; a light show to let us know (as if we didn’t know already) that we are in a pretty extraordinary place. 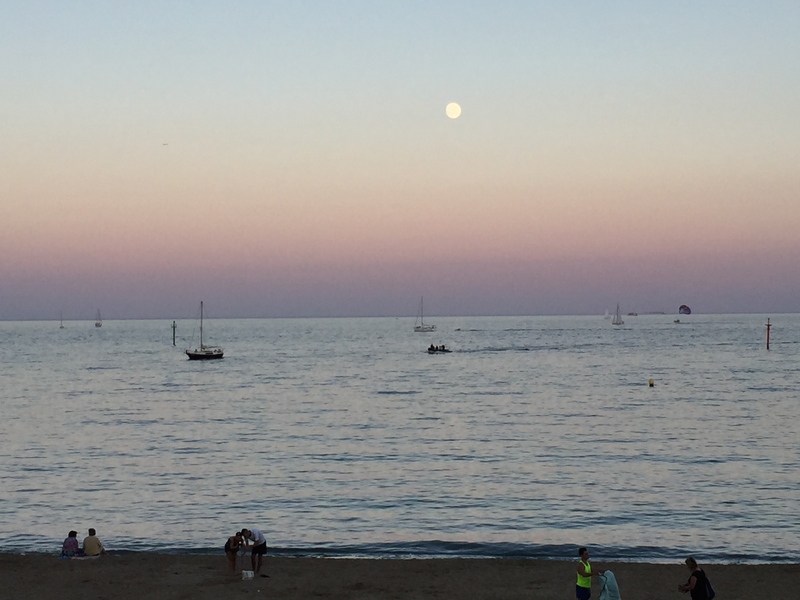 After dinner we go for a quick ramble down La Rambla (has to be done – walk and pun!) and then back to the hotel and our completely gorgeous bedroom. Oh, it’s a tough life! Breakfast the next morning was in a class of its own. The spread that met us as we entered the dining had to be seen to be believed. It was tempting to spend the morning there scoffing. 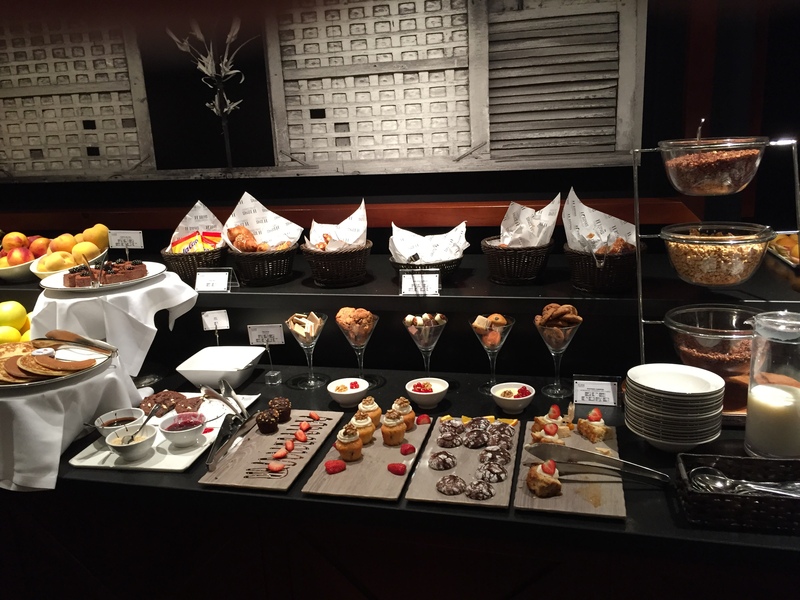 The pastry table in particular… OMG!!! Still Barcelona was calling us. And we only had a few hours. 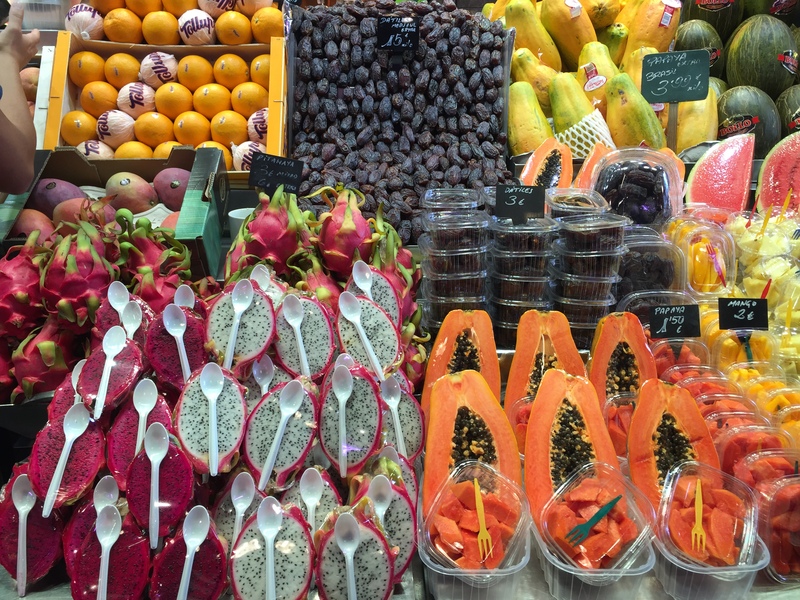 So we enjoyed our breakfast, and then went out and strolled again up La Rambla, with its crowds and its street traders and its nifty flower stalls. 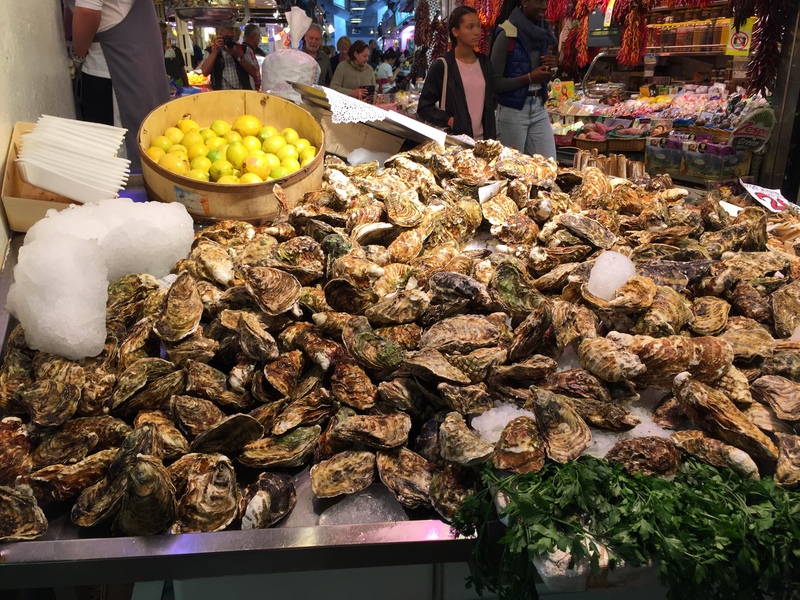 As we wandered Graham suggested going into the Mercado de la Boqueria. Now if I’m honest I’m a bit myeh about markets. In my book a somewhat overrated experience – too often they’re full of the same old tat. But not this one. 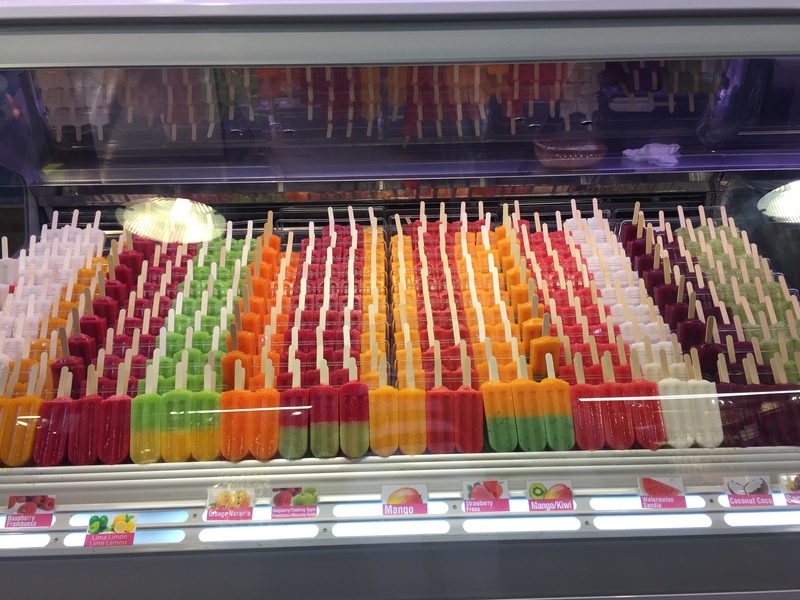 The ice lollies look good. 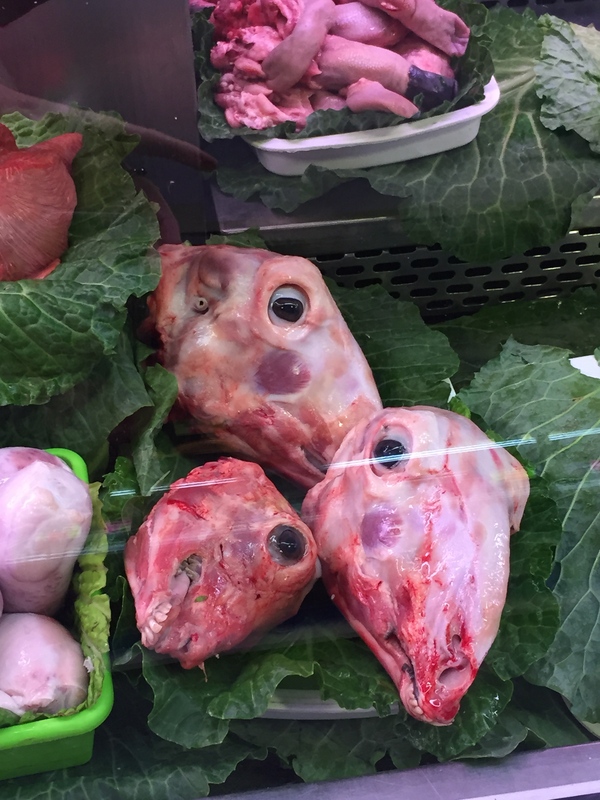 But please not sheep heads! Then on to the cathedral to wander and marvel. Next stop – a walk with Gaudi at the Gaudi Exhibition Centre. When you don’t have much time in a place you have to focus. So we did – on the unique architect who has had so much to do with making this city what it is. 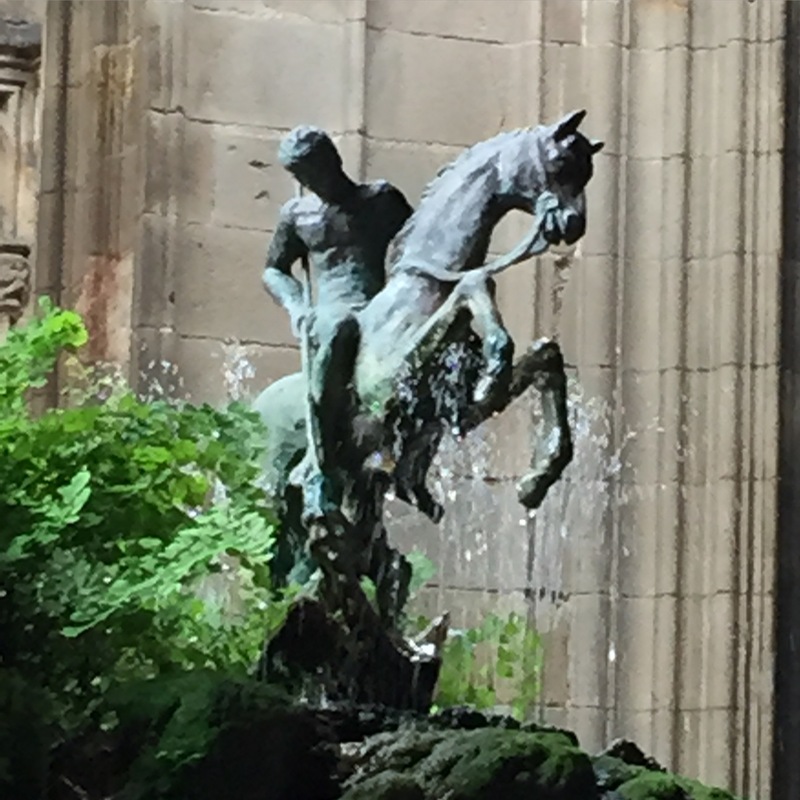 A Walk With Gaudi is a brand new museum/exhibition, right next to the cathedral, which takes you through the story of Gaudi, his life and influences. And it’s excellent. We left the museum, grabbed a taxi, and headed to the Sagrada Familia. Because when you’ve been given such a great taste of Gaudi, you have to go and see his most famous building. It is his unfinished masterpiece. Showcases his passion for the organic, the free flowing, the natural. 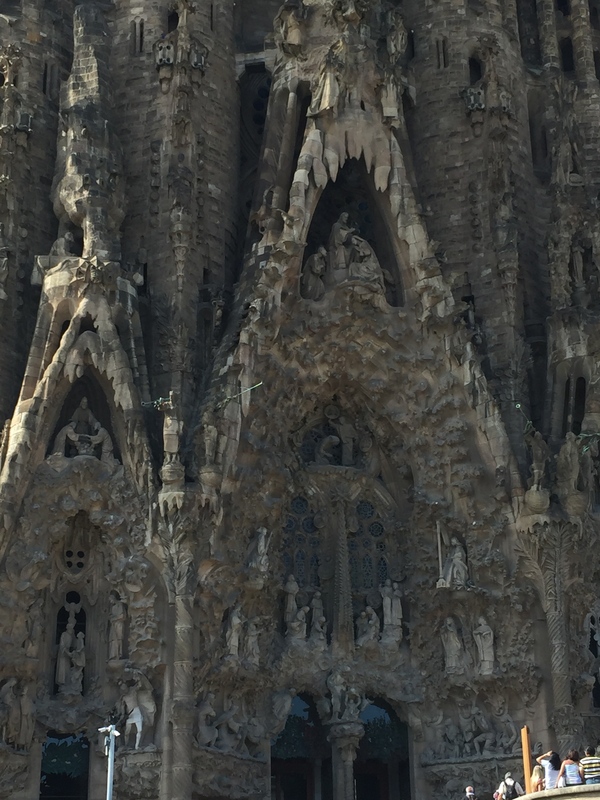 The son of a coppersmith Gaudi had inordinate respect for the skill of craftsmen. So the fact that this building is work in progress, that the city of Barcelona is finishing the job Gaudi started, seems completely and utterly right, so that the cranes and the workmen seem as much part of the experience of the building as the building itself. 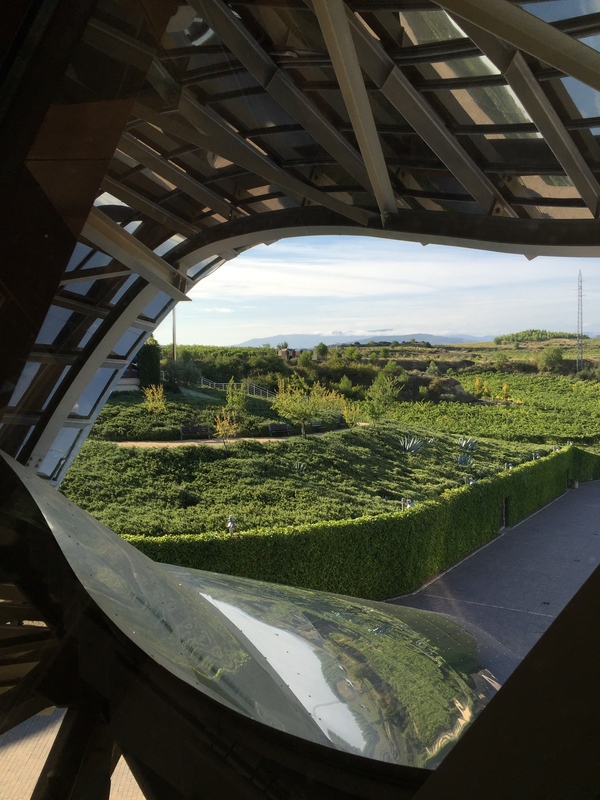 We headed back to the hotel, ate a light lunch on the roof terrace, and left Barcelona to drive north – making our way towards the extraordinary Marques de Riscal Hotel. 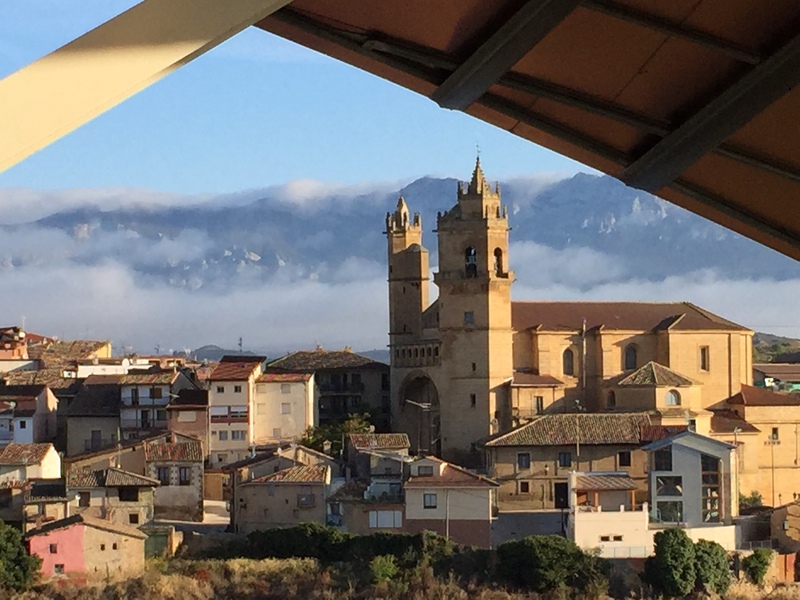 Four hours drive, and we are deep in Rioja country: hills and valleys and a ridge of far mountains, vineyards on all sides, tractors pulling trailers loaded with crates of grapes, slowing the traffic to walking pace in front of us. We take the road to Elciego. On the hillside ahead and to the right something winks and flashes in the late afternoon sunshine. 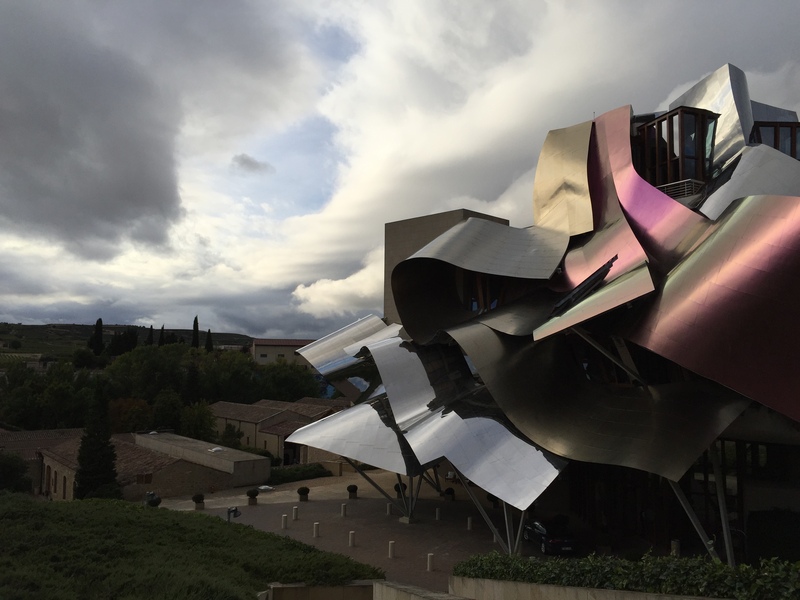 This is the Frank O Gehry designed Marques de Riscal hotel. And it’s where we are spending our last night in Spain. As we drove towards it I wasn’t entirely convinced. Did I like it? I wasn’t sure. But the more time I spent with it, the more I liked it. Until I ended up completely smitten. You know the really great paintings, where the more you look the more you see. Well this building worked the same kind of magic. 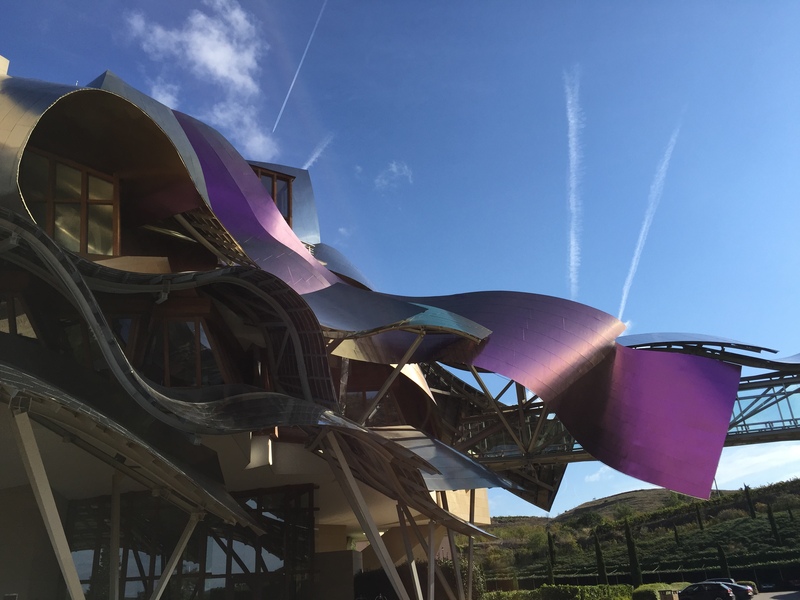 As we explored I could see the undulating hills and valleys of Rioja, wine pouring and flowing, red and white and rose, the foil peeling back from the necks of bottles. The gleaming surfaces reflected the sky, the scenery; the building shifted with the light, changing character from one moment to the next. It was utterly and gobsmackingly fantastic. Our bedroom was super comfortable, ultra modern, teched up to the eyeballs so that even the curtains drew back at the touch of a button. Of course there was a bottle of wine to welcome us. And the windows opened out like an eye onto bodega and hills, framing the sensational view. The only bit that didn’t work quite so well for us was the public space: the hotel reception, the Bistro dining room (where we ate an absolutely delicious dinner and drank, as you would expect, fantastic wine), the library/bar on the top floor. These areas with their towering ceilings were more high than wide; the white walls and minimalist decor, whilst completely in keeping with the building, felt a little lacking in character. We couldn’t escape the feeling that at dinner we were eating in a corridor. And the piped music that played everywhere – it was rather like being stuck in a lift. We spent a very comfortable night, lay in bed the next morning and watched the sun come up on the hills, ate an excellent breakfast (although I was beginning to suffer from an overabundance of food) and headed to the stylish and elegant wine shop to stock up on a few cases before embarking on the last leg of the last leg of our drive. An hour to Bilbao. We were going to stop at the Guggenheim Museum and add another Frank Gehry building to our list of experiences. But the traffic in Bilbao was stopstart, all the carparks we drove past seemed to be full, and we didn’t want to leave our loaded with goodies car on a street. So we drove past and had as good a look as we could, and then headed to the ferry port. You might have thought that this last stretch, twenty four hours on a boat, with all the fun stuff done, might drag. But it really didn’t. It was helped by the fact that it was a beautiful day, warm and bright and calm. It was helped by the fact that the ferry was half empty. That night, in the restaurant, I was one of only two or three women. All around us motorbike enthusiasts and classic car buffs were enjoying their dinner. Conversation focussed on crankshafts and spark plugs and the best place to get a decent cup of coffee on the A3. My lovely lovely dad, who died four years ago this week, was a passionate lover of old motorbikes and cars. I grew up with these conversations. It felt very familiar and rather wonderful and the perfect way to end a memorable holiday. A good night’s sleep, breakfast, a couple of hours playing Candy Crush (there… I’ve admitted it) and we can see land on the horizon. 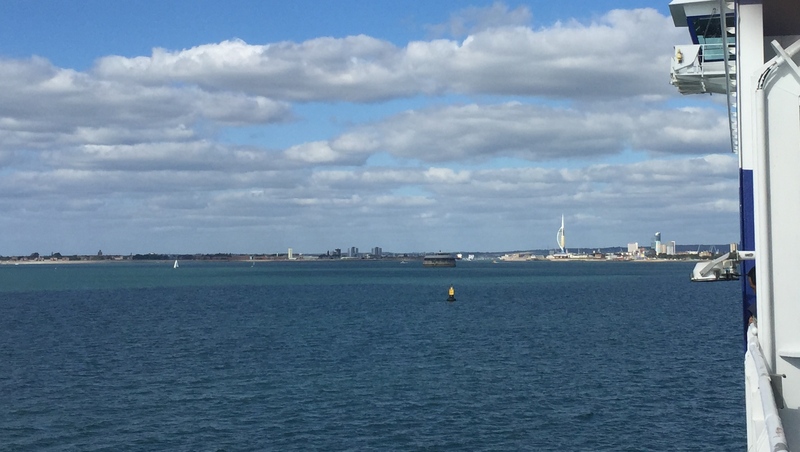 We go past the Isle of Wight and come into Portsmouth in sunshine. Down to the car, off the boat, back to driving on the left, back to bumpy surfaces and lots of traffic. And in just under an hour we’re turning into our driveway. And it’s all over. We’ve had the most wonderful time. And we can’t wait to do it again. Oh my goodness! This sounds like the perfect escape and I couldn’t agree more with you about looking at the getting there and the leaving in a different way. Airports can just be awful! I mean it’s fine when you are excited about going off on a trip but there is nothing worse than smelling that jet fuel as you are about to take off to come home! 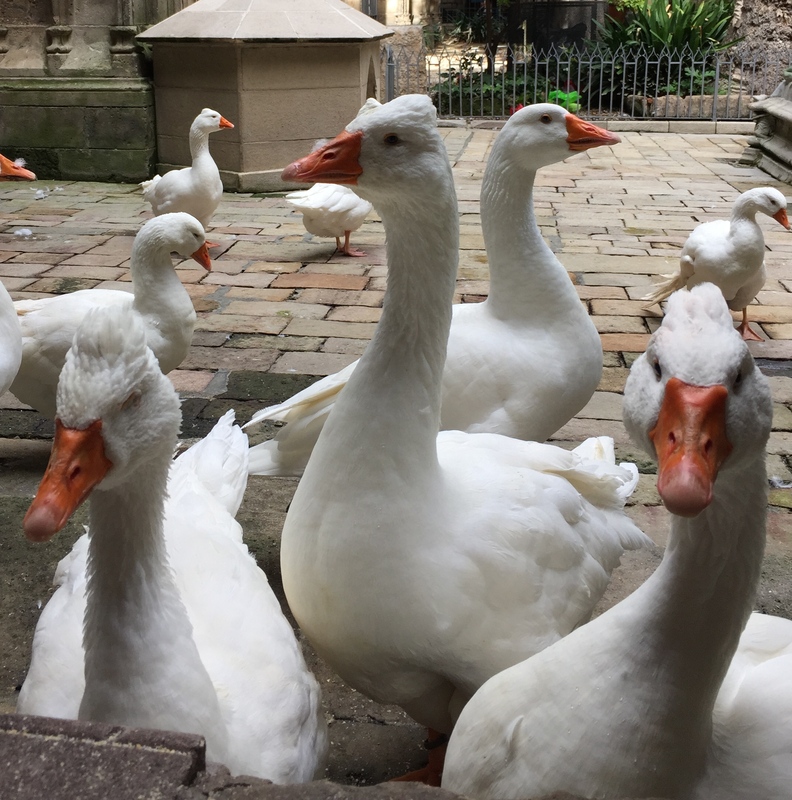 I loved all your beautiful scenic photos – Olite and its castle look beautiful, the gorgeous pics of Majorca itself, Barcelona, the Sagrada Familia and that amazing Marques de Riscal hotel…just stunning. I have not yet made it to Barcelona or Majorca, just Madrid which we love. This has now got me wanting to plan a trip! Oh and I am going to show my hubby Abramovitche’s boat (or is it a ship??) – one of five??!! He will love to see that!